Eight years ago, when we started letting apartments, villas and holiday homes in Sicily through our website on-Sicily.com, we wanted to offer our guests an extensive service. Amongst other things we started to offer (cooking) classes, diving activities, boat trips, pizza courses and car hire. We also wanted our guests to know where they could find the best restaurants in the area, because when we were tourists, we usually found that one great place with excellent food on the last night of our holiday… So we accepted the “arduous task” to test dozens of restaurants in the region, in various price ranges, from simple trattorie and agritourismi to restaurants with fine cuisine. At the restaurants with excellent dishes and a great service, we arranged with the owners that our guests would also get a discount and/or some other perk, like a homemade dessert or a good bottle of wine. These discounts and extras were printed on vouchers which our guests received on arrival in Sicily. The vouchers worked well, but they weren’t very practical: with each change new vouchers had to be printed and all voucher packs had to be modified. This system was also limited to restaurants and wasn’t useful to indicate where for instance the best bakeries, delicatessen shops, bars, shops or greengrocers were located. 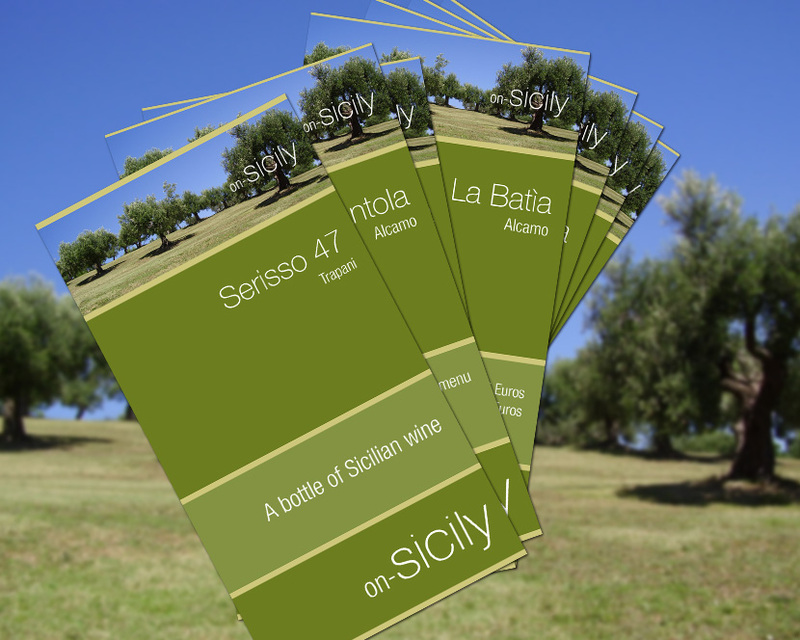 So in 2012 we introduced the on-Sicily card. 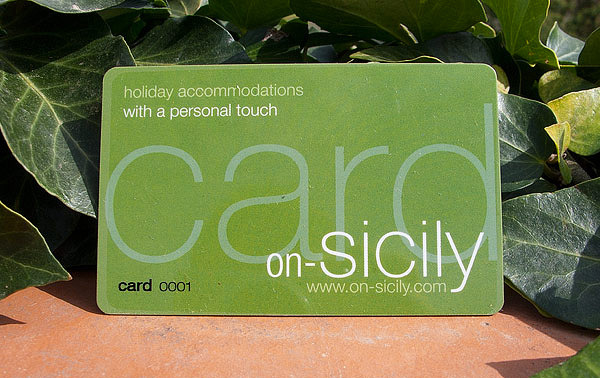 on-Sicily guests could uses this card in the best restaurants, bars, shops and lidos in the area. From this point on the discounts and perks and the descriptions of the participants were mentioned online. Because we received many requests from tourists who wanted to buy our card and because our own guests thought it was a pity that the card couldn’t used in eastern Sicily, we decided to come up with a new card, intended for anyone who goes to Sicily. That was the start of the onsicilycard project! To us it was very important that the new onsicily card was a complete package, offering lots of service, tips and information, like we had been offering the on-Sicily guests. But it should also offer even more, like a navigation option and much information and many photos of all the places of interest in Sicily. Through our Twitter account we had informed our guests about (village) festivals, concerts and other events in the area and we also wanted to incorporate this service into the new concept. Cardholders should also get discounts and perks and only participants who provide great quality and an excellent service would be added to our list of participants. 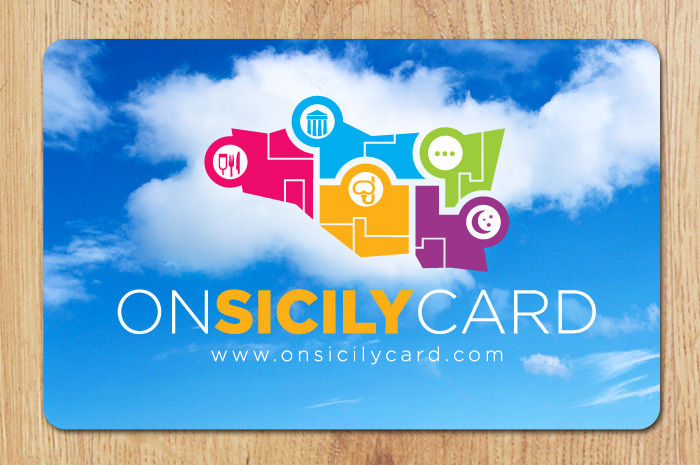 After 7 months of preparation the new onsicilycard and website was launched in April 2014.